A FANTASTIC fun trip Florida was enjoyed by 36 students from Haslingden High School. The students toured theme parks including Disney World, swim centre Wet and Wild, Orlando’s SeaWorld and Universal Studios. They also took a trip out to the Kennedy Space Station where they had hoped to see a launch but unfortunately it was cancelled at the last minute. For one student Lewis Gore, 16, it was the first time he had flown in a commercial plane. He said: “I have had some flying lessons in a small plane at Blackpool Airport, but nothing like this. It was so loud it made my ears pop and it was all very nerve wracking going down the runway. For Isabella Kenyon, 16, the best bit was getting to know the other students and teachers. 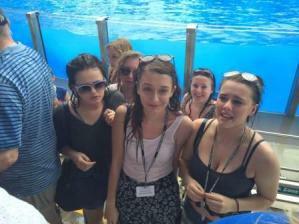 Another student Emily Creedon celebrated her 16th birthday on the day that the group visited SeaWorld and all got soaked by a whale. Maths teacher Heather Pearce said: “The students were fantastic right from the start and they were praised by the flight attendants, the park staff and everyone who came into contact with them.